The New York Giants placed linebacker Jonathan Casillas (neck/wrist) on Injured Reserve on Wednesday. Casillas suffered through an injury-plagued season, playing in eight games and missing four others due to injuries. He finished the season with just 35 tackles and one pass defense. To fill that roster vacancy, the team has signed wide receiver Darius Powe from the Practice Squad. The Giants originally signed Powe as an undrafted rookie free agent after the 2016 NFL Draft and he spent the 2016 season on the team’s Practice Squad. The Giants signed him to the Practice Squad again in October 2017. Powe is a big receiver with decent overall athleticism. The Giants signed linebacker Derrick Mathews to the Practice Squad. Mathews was originally signed to the Practice Squad of the Washington Redskins in November 2015 as an undrafted rookie free agent. The 6’0”, 232-pound Mathews was signed by the Green Bay Packers in August 2016 and spent parts of 2016 and 2017 on the team’s Practice Squad. The Giants also waived linebacker Nigel Harris from Injured Reserve. Harris was placed on Injured Reserve with a rib injury in November. The 6’2”, 230-pound Harris was originally signed as an undrafted rookie free agent by the San Diego Chargers after the 2017 NFL Draft. The Giants claimed Harris off of waivers from the Chargers in October 2017. Other players recently waived (since November) from Injured Reserve include defensive end Evan Schwan, linebacker J.T. Thomas, wide receiver Kevin Norwood, offensive lineman Adam Gettis, defensive tackle Corbin Bryant, and defensive end Nordly Capi. Running back Orleans Darkwa (illness), offensive lineman Justin Pugh (back), defensive end Jason Pierre-Paul (finger), and cornerback Eli Apple (hip/back) did not practice on Thursday. Running back Wayne Gallman (hip), wide receiver Sterling Shepard (hamstring), offensive tackle Chad Wheeler (concussion), defensive tackle Damon Harrison (elbow), and linebacker B.J. Goodson (ankle) practiced on a limited basis. The New York Giants practice on Friday at 10:55AM. Interim Head Coach Steve Spagnuolo and players will address the media after practice. 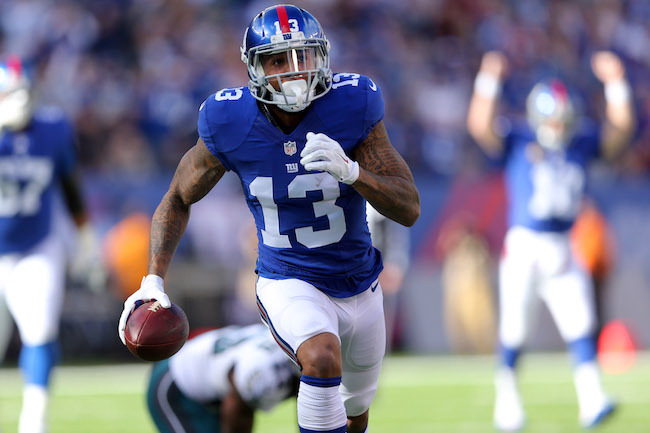 2016 YEAR IN REVIEW: While Odell Beckham, Jr. continued his assault on the record books as one of the game’s premiere wide receivers, more was expected from this unit in 2016. It was assumed by many that the departure of the frustratingly-inconsistent Rueben Randle would be addition by subtraction. Sterling Shepard was considered a 2nd-round steal by many. And there were high expectations about the return of Victor Cruz from three injury-sabotaged seasons in a row. In 2015, quarterback Eli Manning’s top three wide receiver targets were Beckham, Randle, and Dwayne Harris. These three totaled 189 catches for 2,643 yards, and 25 touchdowns. In 2016, Beckham, Shepard, and Cruz totaled 205 catches for 2,636 yards, and 19 touchdowns. The telling stat was there was a 24 percent decline in touchdowns. Opponent defensive game plans were obvious and consistent: double- and sometimes even triple-team Odell Beckham and dare the Giants to beat them with their running game or passing the ball to other targets. The Giants failed to be able to make other teams pay and the passing offense fell from 7th (271.4 yards per game) to 17th (242.4 yards per game). Much of this decline had to do with the loss of running back Shane Vereen (59 catches for 494 yards and four touchdowns in 2015) and the unproductive tight ends (only 79 catches and three touchdowns as a group). But while Beckham continued to produce, and Shepard had a respectable rookie season, it was Cruz who was the biggest disappointment. Slowed by three consecutive leg injury issues from 2013-2015, Cruz seemed miscast as an outside receiver instead of the slot position which Shepard now occupies. Cruz struggled to separate from defenders and finished the season with only one touchdown – ironically a game-winner that he scored in the opener. In other words, he was kept out of the end zone for the final 16 regular- and post-season games. Randle had 57 catches for 797 yards and eight touchdowns in 2015 as an outside receiver. Cruz had just 39 catches for 586 yards. The nadir of Beckham’s 2016 season was obviously the playoff game. Much was expected and Beckham failed miserably to deliver (four catches for 28 yards) against a weak secondary. Exacerbating the situation – right or wrong – was his boat trip to Miami six days before the game on the players’ day off. But keep in mind that the receivers as a group went on that trip – including the veteran Cruz – and the top three all failed to perform at a high level (Cruz had three catches for 30 yards and Shepard four catches for 63 yards). None scored. Beckham is extremely competitive and the best player on the team. But he clearly is a diva with a media target painted on his back. How much of this is self-promotion, blown out of proportion to sell newspapers, or distracting to the team are questions subject to passionate debate. ADDITIONS/SUBTRACTIONS: Easily one of the biggest changes the team made this offseason was at the wideout position opposite of Odell Beckham, Jr. 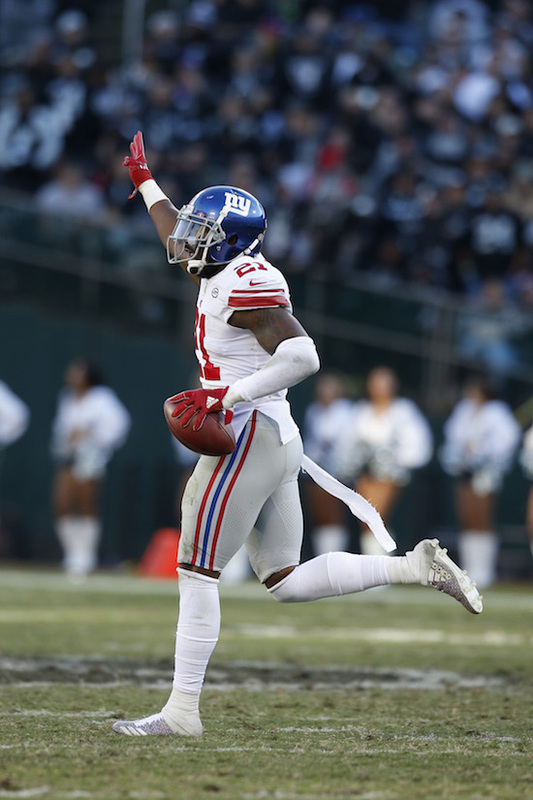 The Giants unceremoniously cut Victor Cruz in February and signed the aging but still-productive super-stud receiver Brandon Marshall in March after the Jets released him. The Giants also signed undrafted rookie free agents Travis Rudolph, Keeon Johnson, Kevin Snead, and Jerome Lane. TRAINING CAMP STORY LINES: Right or wrong, the media has smelled blood in the water with Odell Beckham, Jr. and he will likely remain the subject of unsavory media attention for the remainder of his NFL career. Much of this is self-inflicted, but also much of it is media-whore click-bait. The focus on Beckham distracts from real issues and is a waste of print space and Q&A media time, but it is what it is. Expect of a heavy does of boring and repetitive Beckham stories in camp. The real focus of attention should be two-fold: (1) how much does Brandon Marshall have left in the tank? and (2) is Sterling Shepard ready to make a huge impact on the passing game? Marshall is the only player in NFL history with six seasons of 100 or more receptions. Two years ago, Marshall put up huge numbers and had a Pro Bowl and All-Pro season, catching 109 passes for 1,502 yards, and 14 touchdowns. But the 33-year old Marshall suffered through a injury-plagued 2016 campaign where his numbers dropped to 59 receptions for 788 yards and just three touchdowns. He says he only wants to play two more years. If Marshall can regain even a bit of his 2015 form (with crappy Jets quarterbacking), look out. Eli Manning hasn’t had a big, physical receiver like this since Plaxico Burress in 2008. Shepard largely flew under the radar with a promising initial season, starting all 16 regular-season games as a rookie, catching 65 passes for 683 yards (10.5 yards per catch) and eight touchdowns, mostly out of the slot. But Shepard did not make many impact plays, his longest reception being just 32 yards. Shepard made a lot of noise this spring during non-contact workouts. He could be poised for a big season with defenses focused more on Beckham and Marshall. With special teams ace Dwayne Harris likely to make the squad, much fan attention will be spent on which players fill out the #5 and probably #6 receiver spots. 2016 hold-overs Tavarres King, Roger Lewis, Darius Powe, and Kevin Norwood will compete with the four undrafted rookie free agents signed after the draft. King passed Lewis on the depth chart late in the 2016 season and made some noise with a couple of long receptions. King received some quality snaps with the first unit during spring workouts while Lewis was arrested on a substance-abuse charge. But don’t discount Lewis or 2016 practice squad player Powe, who has good size and has worked hard this offseason. Of the newcomers, Rudolph probably has the best shot. Those who stand out on special teams will have the inside track. ON THE BUBBLE: Tavarres King, Roger Lewis, Darius Powe, Kevin Norwood, Travis Rudolph, Keeon Johnson, Kevin Snead, and Jerome Lane. PREDICTIONS: Victor Cruz and Larry Donnell/Will Tye were major drags on the passing game in 2016. 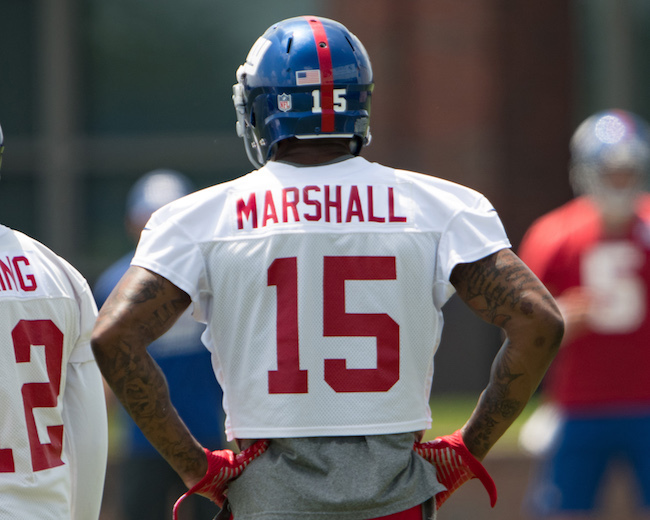 The additions of Brandon Marshall and Evan Engram should not only be substantial upgrades in themselves, but should dramatically open things up for Odell Beckham, Jr. and Sterling Shepard. If Eli and Marshall can develop anything similar to the chemistry Eli had with Plaxico Burress, then the passing game should become one of the NFL’s best again. Watch out for Shepard, who may feast on single coverage out of the slot. (Though with the additions of Engram and Rhett Ellison at tight end, Sheppard may see his playing time cut, particularly in the red zone). Barring injury, it will be hard for any other receiver to make substantial noise with Beckham, Marshall, Shepard, Engram, and Ellison bound to see so much playing time. FINAL DEPTH CHART: Odell Beckham, Jr., Brandon Marshall, Sterling Shepard, Dwayne Harris, Tavarres King, and Darius Powe. (The last WR spot is one of the hardest predictions to make). While Odell Beckham, Jr. continued his assault on the record books as one of the game’s premiere wide receivers, more was expected from this unit in 2016. It was assumed by many that the departure of the frustratingly-inconsistent Rueben Randle would be addition by subtraction. Sterling Shepard was considered a 2nd-round steal by many. And there were high expectations about the return of Victor Cruz from three injury-sabotaged seasons in a row. Beckham is extremely competitive and the best player on the team. But he clearly is a diva with a media target painted on his back. How much of this is self-promotion, blown out of proportion to sell newspapers, or distracting to the team are questions subject to passionate debate. If the Giants are to reach the next level, he has to continue to mature (he did with respect to his reaction to on-field taunting) and perform in the clutch in the post-season. But the Giants also have to get him more help. 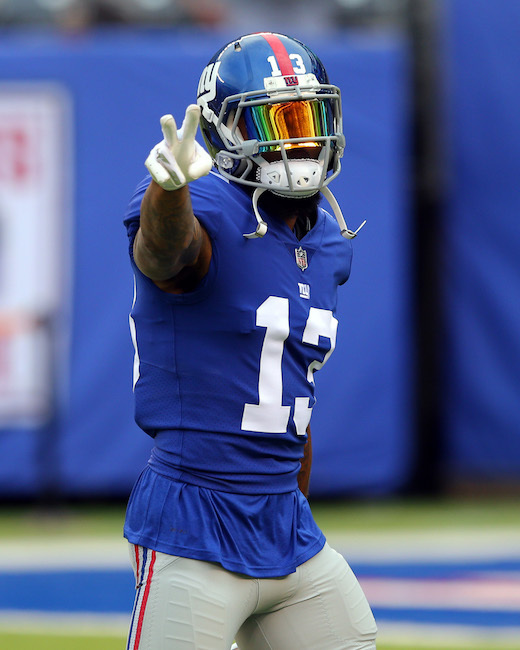 Odell Beckham is one of the game’s best players and had another stellar season in his third year, starting all 16 regular-season games and finishing with 101 catches for 1,367 yards and 10 touchdowns. In his first three seasons, Beckham has accrued 288 catches for 4,122 yards and 35 touchdowns in 43 regular-season games. Beckham’s accolades already include Pro Football Writers of America “Rookie of the Year” (2014), second-team All-Pro (2015, 2016), and Pro Bowl (2014, 2015, 2016). All of this despite constant double teams by opposing defenses. Beckham was drafted in the 1st round of the 2014 NFL Draft by the Giants. While Beckham lacks classic size, his long arms, big hands, and tremendous jumping ability give him a very good catch radius. Beckham is an explosive athlete with excellent speed, quickness, and agility. He is able to play multiple positions, including the slot. Beckham runs good routes, is very quick out of his breaks, adjusts exceptionally well to the football, and regularly makes the circus catch. He is very dangerous with the football in his hands after the catch. Competitive, passionate, and hard working, Beckham’s biggest negatives are his maturity and temperament. Beckham has a target painted on his back and has to deal with other teams trying to get under his skin. He did not play well in the playoff loss to the Green Bay Packers and suffered from more drops than usual in 2016, which may partly have been the result of a thumb injury. Sterling Shepard was selected in the 2nd round of the 2016 NFL Draft by the Giants. Shepard started all 16 regular-season games as a rookie, catching 65 passes for 683 yards (10.5 yards per catch) and eight touchdowns, mostly out of the slot. Shepard lacks ideal size, but he is strong and quick with good speed. Shepard runs good routes, is tough going over the middle, adjusts well to the football, and has good hands. He did not make many plays down the field however, with his longest reception being for 32 yards. The good news is that Victor Cruz finally returned to the playing field in 2016 after missing most of 2014 with a career-threatening patellar tendon knee injury and all of 2015 with a calf injury – both of which required surgeries. The bad news is that Cruz no longer looks like the same player he was in 2011-2012, when he was one of the best in the game. Three lower leg surgeries in three years, including arthroscopic knee surgery in 2013, have taken their toll. In 15 regular-season games in 2016, Cruz caught just 39 passes for 586 yards and one touchdown. Signed as a rookie free agent after the 2010 NFL Draft, the rags-to-riches Victor Cruz story is well known, culminating with his impact season in 2011, first Pro Bowl in 2012, and big offseason contract in 2013. In 2011-2012, Cruz compiled 168 catches for 2,628 yards and 19 touchdowns. Cruz always had ordinary size and timed speed. However, his pre-injury quickness and ability to separate from defenders appears to be gone. Cruz has good hands and is capable of making the circus catch, though he sometimes will drop the easy reception. Cruz is better suited for the slot position. In his second year with the Giants, Dwayne Harris suffered through a frustrating, injury-plagued season. While he played in all 16 regular-season games with one start, Harris was hampered by a variety of nagging injuries all season. A year after his career-best 36 catches for 396 yards and four touchdowns, Harris caught only one pass for 13 yards and a touchdown. More importantly, his special teams return numbers plummeted with his punt return average falling from 10.0 yards to 5.9 yards and his kickoff return average falling from 28.7 yards to 24.2 yards. He also did not score a year after becoming the first Giants player in 60 years to return a kickoff and punt for a touchdown in the same season. Harris did remain a force on punt coverage and he was voted to his first Pro Bowl. Harris was originally drafted in the 6th round of the 2011 NFL Draft by the Cowboys. The Giants signed him in free agency in March 2015. Though he lacks height, Harris is a well-built athlete with decent speed and quickness. He is tough and physical and an asset as a blocker in the running game. Harris can play in the slot and has decent hands. Harris has four career returns four touchdowns and has won the “NFC Special Teams Player of the Week” award four times in his career. The Giants signed Roger Lewis as an undrafted rookie free agent after the 2016 NFL Draft. Lewis made the team and played in 13 regular-season games with one start. He finished with just seven catches for 97 yards and two touchdowns. Lewis has decent size and is a good athlete. He flashed the ability to make plays down the field but he needs to become a more consistent pro-level route runner. Lewis was utilized on special teams as a gunner on punt coverage. Tavarres King played in seven regular-season games, finishing the year with just two catches for 50 yards. He caught three passes for 73 yards, including a 41-yard touchdown pass in the playoff loss to the Packers. King was originally drafted in the 5th round of the 2013 NFL Draft by the Denver Broncos. He has spent time with the Broncos (2013), Panthers (2013-14), Jaguars (2014), and Buccaneers (2014-15) – playing in just two regular-season games. The Giants signed King to the Practice Squad in late September 2015. King is a tall, thin receiver with very good speed. He is not a physical player and is best suited as an outside receiver. Darius Powe was signed to the Practice Squad in September 2016. The Giants originally signed Powe as an undrafted rookie free agent after the 2016 NFL Draft. Powe is a big receiver with decent overall athleticism. Kevin Norwood was signed to the Practice Squad in November 2016. Norwood was originally drafted in the 4th round of the 2014 NFL Draft by the Seattle Seahawks. Norwood has spent time with the Seahawks (2014), Carolina Panthers (2014-2015), and San Diego Chargers (2016). The Chargers terminated his Practice Squad contract in November. Norwood has played in 10 regular-season games with two starts. He has nine career receptions for 102 yards. Norwood is a big (6’2”, 210lbs), physical possession receiver who runs good routes. He lacks ideal speed and quickness. Ben Edwards was waived/injured and then placed on Injured Reserve in May 2016 after tearing an anterior cruciate ligament (ACL) in one of his knees during the rookie mini-camp. Injuries have plagued Edwards who tore an ACL in college in 2013, an injury that caused him to miss all of 2014; pulled his hamstring in a June 2015 mini-camp, an injury that led him to being waived/injured; and sprained his knee in an April 2016 mini-camp. The Giants originally signed Edwards after the 2015 NFL Draft, waived/injured him in June, re-signed him to the Practice Squad in November, and signed him to the 53-man roster in December. He played in the final two games of 2015 and finished the season with one catch for nine yards. Edwards lacks ideal size and timed speed, but he is a quick receiver who plays faster than he times. Edwards runs very good routes, adjusts well to the football, and has good hands. He has experience playing in the slot and returning punts. The New York Giants have signed offensive guard/center Adam Gettis to the 53-man roster from the Practice Squad. To make room for Gettis, the team place safety Darian Thompson on Injured Reserve. Thompson will undergo surgery to repair a foot injury that has sidelined him since mid-September. The Giants drafted Thompson in the 3rd round of the 2016 NFL Draft. He injured the foot during the Week 2 victory over the Saints and suffered a setback last week when returning to practice for the first time since suffering the injury. Gettis was originally drafted in the 5th round of the 2012 NFL Draft by the Washington Redskins. He has spent time with the Redskins (2012-2013), Steelers (2014), Giants (2014-2015), Raiders (2015), and Giants again (2015-2016). Gettis has played in 14 regular-season games with no starts, 13 of those games coming with the Redskins in 2013. The New York Giants have signed wide receivers Kevin Norwood and Da’Ron Brown to the Practice Squad after wide receiver Geremy Davis was signed off the team’s Practice Squad by the San Diego Chargers and Adam Gettis was signed to the 53-man roster from the Giants Practice Squad. Norwood was originally drafted in the 4th round of the 2014 NFL Draft by the Seattle Seahawks. Norwood has spent time with the Seahawks (2014), Carolina Panthers (2014-2015), and San Diego Chargers (2016). The Chargers terminated his Practice Squad contract on November 1st. Norwood has played in 10 regular-season games with two starts. He has nine career receptions for 102 yards. Norwood is a big (6’2”, 210lbs), physical possession receiver who runs good routes. He lacks ideal speed and quickness. 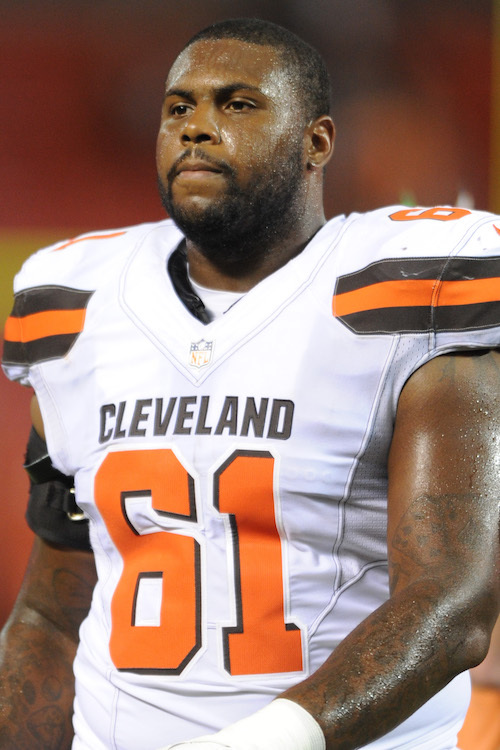 Brown was originally drafted in the 7th round of the 2015 NFL Draft by the Kansas City Chiefs. He has spent time on the Practice Squads of the Chiefs (2015) and New England Patriots (2016). Brown is strictly a possession receiver with ordinary size, speed, and quickness. He has great hands. Davis was drafted in the 6th round of the 2015 NFL Draft by the Giants. He played in 10 games with no starts as a rookie and finished the season with only two catches for 21 yards. New York Giants safety Landon Collins has been named “NFC Defensive Player of the Week” for his performance against the Philadelphia Eagles last Sunday. In that game, Collins accrued 12 tackles, 1 sack, 1 tackle for a loss, and 1 interception. Collins won the same honor before the bye week against the St. Louis Rams in London. When Sterling Shepard and Roger Lewis scored against the Philadelphia Eagles, it was the first time the Giants had two rookie wide receivers with touchdown catches in the same game since October 5, 1987 when Lewis Bennett and Reggie McGowan accomplished the feat in a strike replacement game vs. San Francisco. Excluding replacement games, it had last happened on December 12, 1954, when Ken MacAfee and Bob Topp did it at Philadelphia. The Giants are the only NFL team to have multiple rookie wide receivers (Shepard and Lewis) with two or more touchdown catches. 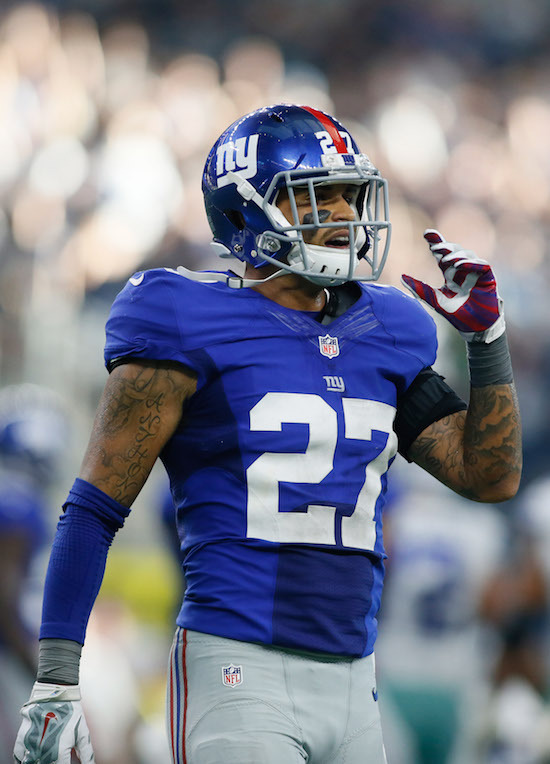 Safety Landon Collins leads the Giants in tackles (69), sacks (3.0) and interceptions (3). He is the only player in the NFL to lead his team in all three categories this season. No Giants player has led the team in both sacks and interceptions in a full season since sacks became an official statistic in 1982. The Giants have rushed for less than 80 yards in each of the last five games, the first time that’s happened since official rushing records were first kept in 1933. The Giants have the best defensive red zone percentage in the NFL. They have only allowed touchdowns on 39.3% of opponent red zone trips through Week 9. The Giants return to practice at 12:10PM on Thursday.